Commemorative Stamp Committee This Committee of the American Federation of Mineralogical Societies is responsible for the efforts to obtain stamps featuring subjects of interest such as minerals, fossils, gems and general geology. The Committee has been active for years and submits an annual report at the AFMS annual meeting. 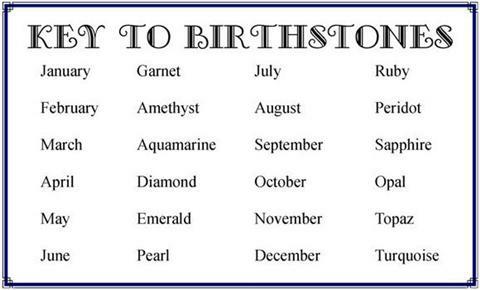 Our current efforts are directed to trying to convince the United States Postal Service to produce stamps showing Birthstones. No stamps featuring gems have ever appeared on US commemorative stamps although there have been some beautiful ones produced by other countries. (There is a definitive $0.02 US stamp showing Turquoise Indian Jewelry in circulation now, not as a result of our efforts.) The mechanism is to encourage both AFMS members and the public at large to send requests to the Citizens Stamp Advisory Committee (CSAC) of the United States Postal Service (USPS.) It is very difficult to succeed in getting any desired stamp. Only about one out of a thousand requests are approved. It took 10 years of lobbying efforts to get the first set of Mineral Stamps in 1974 and 18 years to get the second set in 1992! The USPS has rules by which CSAC, operates. They recommend adoption of stamp subjects, although the Postmaster General has final say. Rules say there will be no repeat subjects in 10 years. Regions: Keep promoting Birthstones on Stamps in your Federation. Publicize in your newsletter, urging member clubs to participate. 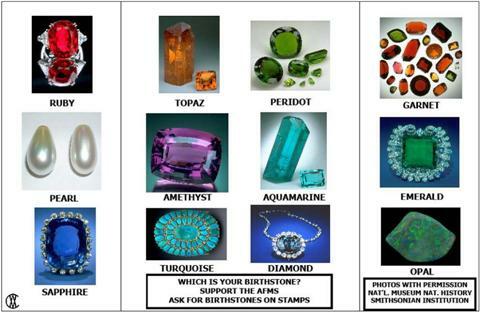 Clubs: Keep promoting Birthstones on Stamps. Publicize in your newsletter. A promotional flier has the USPS CSAC address and may be used to solicit individuals to support our efforts. A petition form is useful for groups to sign. All AFMS Clubs are strongly encouraged to make copies of them. Use them at your club meetings, at your shows, and to groups your members might encounter such as when presenting talks at schools, to Boy or Girl Scouts, or at Nature Centers etc. A tent card for use with the fliers at your shows can also be used. “Free, Take One” and “Sign Here” masters are available for you to use. Non AFMS members are also requested to support the campaign. Although many of you may have previously written, do it again so we flood the USPS with requests. Commemorative Stamp Exhibit with Lauren Williams, AFMS President, at Promotional Exhibit at the July 2011 AFMS Convention in Syracuse NY. AFMS Birthstones on Stamps Display for a Show 2012.